-I went on Outreach Week to Northpoint EV Free. My brother, Billy, is the junior high pastor there, so it was great to stay with him. Our team served the church in a variety of ways. We painted. We taught the Junior High group and Sunday School classes. We painted. We evangelized at Riverside Community College. We painted. We organized some storage rooms. We painted. We attended the Junior High group’s 80’s Skate Night. And we painted. All in all, it was a great week. -I’ve spent some Friday nights hanging out with friends in Santa Monica. In the midst of busy college life, there is just something about the sound of the waves crashing under the pier and the darkness of the night over the ocean that reminds me how awesome and constant God is. -I’m co-leading a small group at my Bible Study with a guy who has been at Grace Community Church for 51 years…yes, that’s since the beginning. It’s awesome. Even though I studied and taught on James 3:6-12 last night, I think the most profound and applicable things I learned came from his thoughts in small groups! -I’m loving life in HOTCHKISS! Yes, life is great once again in the REAL Happiest Place on Earth. Today we have a big event that involves games in the park, dinner at the dorm, and a movie in the lounge all before heading down to Mustand Madness! YEAH! Siona pointed this out to me after he got it from another blog. 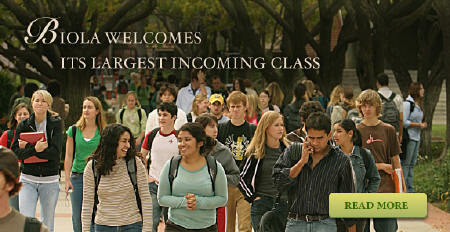 Check out this picture from Biola’s website. The guy on the far right is wearing a Hotchkiss t-shirt. First, the Cup. Next, the world. I have been pretty out-of-the-loop when it comes to American politics over the last few months. Between being in Uganda and camping with high school students, I haven’t had much time or access to the media. Tonight I was able to catch the network television coverage of the GOP Convention. I was pretty curious to see Governor Palin’s speech. Overall, I thought it was pretty good; she spoke well and made some good points. However, a couple things stood out to me from the broadcast. First, I couple not help but think how easily she could be the first female President of the United States. If McCain wins (it’s about a toss-up right now), Palin is only a heart-beat away from the Oval Office. And let’s face it: McCain is no spring-chicken. An article I saw in the LA Times this morning basically said that McCain has over a 10% chance of dying in his first term. Could Sarah Palin become the first female president without actually getting voted in as such? Time will tell. Second, I will never cease to be amazed at how crazy these convention-ites get. From their applause and reaction, I have trouble discerning whether Palin is a politician, a rock star, or the Messiah. They hang on the every word of the speaker. From the comfort of my living room I can almost feel the disgust for anything Obama, Clinton, Democrat, or liberal. I know that any statement that touches conservatism or religion or patriotism or national defense is going to get the crowd hooting and hollering. Let me make some qualifiers to that last comment. I am not saying that as someone who is disinterested with politics or the political system. I am saying that as a Political Studies-Constitutional Law major. I am saying that as the guy who is glued to the TV screen the night of the Iowa Caucuses (hey, you never know when you might miss the next Dean Scream.) I am also not saying that people should not be involved in politics or go to political conventions; those are good things. I’ve even served at a convention before. But sometimes I wonder if people get too sucked-in to the hoopla of politics. And I especially wonder this about evangelicals. Where is the hope of the church to change America? Is it in the McCain-Palin ticket? Or is it in the Gospel? Again, I’m not trying to knock McCain-Palin at all; I plan on voting for them. I’m trying to say that the church needs to remember that the only hope for real change and real revival comes through the gospel. I’m all in favor of a conservative government, but having a church that is on fire for Christ is incredibly more important. I’m interested in the political process. I’m pulling for McCain-Palin. But I’m desperately praying for a church that lives this song out more than anything else. Beth tagged me to do one of these, and this will be my last access to the internet for two weeks, so here goes. 1. was two years old. 2. did not have a clue about what was going on in the world. 3. lived in San Juan Capistrano, CA. 1. was working as a telemarketer. 2. was fired from being a telemarketer. 3. attended Survival Camp for the first time! 1. graduated as Valedictorian of my graduating class of six. 2. attended the Rehrer’s memorial service. 1. returned from a semester of studying in Israel–possibly the happiest 3 1/2 months of my life. 2. listened to lots of John Piper while I worked as a street sweeper. 3. won The Master’s Cup for the second year in a row. 1. saw Wicked with Team 20 Seconds. 2. served as the RA of Hotchkiss Upper Front. 3. went to Uganda on a TMC Missions Trip. 1. learned about how to be committed to expository teaching from Pastor Mike at the CBC staff meeting. 2. practiced with the band for Junior High Revival ’08. 3. attended True North Beach Night at Salt Creek Beach. 1. went shopping to get some things for Revival. 2. ate lunch at In-N-Out Burger. 3. helped load two Budget trucks for Revival. 1. be at Compass by 4:30am. 2. ride up to Lake Isabella. 3. help set up camp for Revival ’08. 1. be Head RA in Hotchkiss and love every second of my senior year at TMC. 2. win The Master’s Cup for the third straight year. 3. start/continue figuring out what I will do with my life. -Thanks to everyone who prayed for Victor and his sister. In surgery on Monday, the doctors discovered and fixed the problem. She is on the road to recovery; Vic is back in Hotchkiss. PRAISE THE LORD! -Outlines are harder than I thought. They give your semester this feeling that you are never done. Even if your other assignments or projects are done, you can always be doing outlines. -Tonight, I got to go to a USC-UCLA Men’s Volleyball game at the Galen Center. UCLA is ranked #4 in the country. USC is…well, they’re not ranked. USC won in five games. I’ll go so far as to say it was the best men’s college volleyball game I have ever attended. Do you ever have those days where you feel like you have nothing to blog about? When I was at IBEX, I had none of those days. Victory is sweet, indeed, and the taste never gets old. 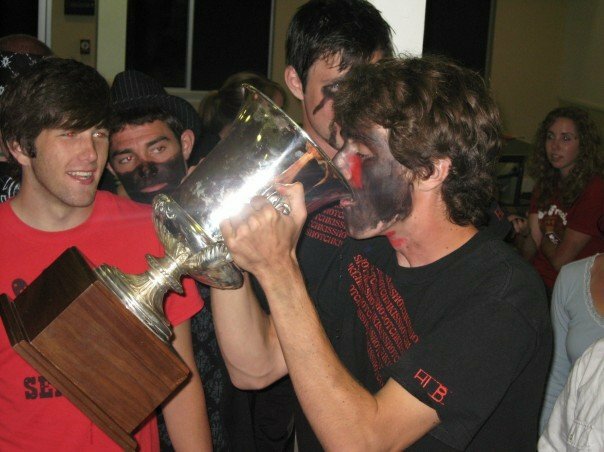 Last Thursday night, the men of Hotchkiss “protected the name” for the second straight year by winning the Master’s Cup, a huge inter-dorm competition. In some ways, this victory was even better than last year’s. Because we were defending the cup, everyone was gunning for us. Also, we had to endure quite a bit of anti-Hotchkiss sentiment before the competition. Hotchkiss has a silent tradition. When we walk into the gym for the cup, we are silent and straight-faced. We do not shout, scream, stomp, or cheer like other dorms. We mean business–we are there to win. Other dorms usually give us a hard time about this. This year, one guy said, “At least our dorm is allowed to have fun.” What that guy does not know is this: Winning the Master’s Cup is extremely fun. But now that the cup has been protected and all the returning students have made their way back to campus, classes have begun yet again. This semester, I’m diving into my major-requirements and taking Intro to Political Research, U.S. Constitutional History, and The Judicial Process. For a Bible requirement, I’m taking Christian Theology II. I am excited to study the different areas of theology we will cover in this class (especially eschatology). On top of these classes I’m taking Business Communications for “fun.” This class does not fulfill any requirements for me, but I keep hearing that it may be the most practical class I’ll ever take, so I decided to take it anyways. Needless to say, I am back to school. Hopefully, I’ll be back to blogging as well. My goal for the semester is one or two posts a week, and I still plan on finishing the Egypt Chronicles. Until next time, we got the cup. This afternoon I’m taking off for Lake Isabella until next Saturday to be a counselor at Revival 07–the summer camp for the high school group at Compass Bible Church. Needless to say, I will not be blogging. I’m psyched out of my mind for this camp. First, this camp will be so fun that it will surely go down as the funnest week of many of these high schoolers’ lives. From dawn til dusk and beyond, the campers will be engaged in some form of fun activity or another, from team games to meal times to worship to tubing on the lake to hanging with friends to Starburst poker. Second and most importantly, I eagerly anticipate what the Lord will do at this camp. Pastor Mike Fabarez will be teaching the campers all week from the story of the rich young ruler, and I am sure that the Lord will use his skilled and solid teaching to work in the hearts of these kids. I’m expecting people to get to saved. I’m confident that those who are seeking the Lord will grow this week. So if you remember, please pray for Revival 07 this week. Hopefully I’ll post about it when I get back! 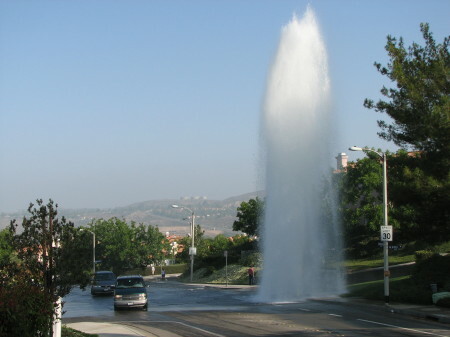 My parents’ home is not located near a river, so I was surprised to find one rushing down the street as I left for church this morning. As I turned the corner I quickly discovered the source. 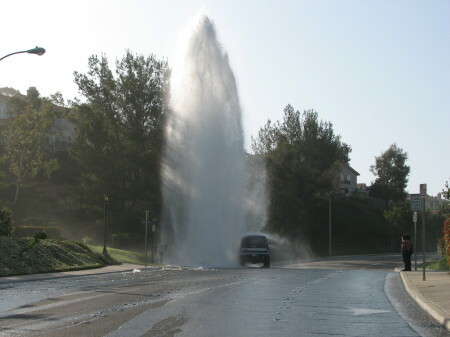 A busted fire hydrant/water pipe had busted just up the street and was shooting water 40+ feet into the air. I don’t see that every day. This car (above) was going for the free car wash.
It’s just been Buddy (my parents’ dog) and I at home this weekend. Don’t think that means it’s been a quiet weekend. Buddy and I probably provide 90% of the noise in the house anyways. You can check out the live blogs with Challies and the Rebelution. The theme of the conference is discernment, and in a few of the messages, I have noticed the topic of church involvement being mentioned. I certainly hope that my generation of Christians becomes passionate about the Word and devoted to the Church. That could mean exciting things.